I will never be major league with my baking - I just don't have the time. It's just something I enjoy which I can just about fit in around being a full-time working mummy because you can bake when they nap or bake with them when they're driving you a little nuts. You can't take a toddler running - well you can buy one of those uber-expensive buggies, but please don't even start on that one. When things are tough, I do get motivated by baking and the pleasure that comes with the results in the immediate aftermath of a flour-filled kitchen. I say immediate because when I clock myself in the mirror several hours later, I always end up guilt-ridden that I would rather stuff my face than make the effort to get up at 4am before work and go running. The motivation is underscored by having had pretty much zero sleep with a very poorly bubba (who is now making z's for all she's worth), I forwent the chance of an hour or two snoozing of my own in favour of starting off a chocolate brioche roll recipe which I found on fabfoodblog and looks like it will take the best part of the day to make. It had better be worth it! So I'm blogging this one in two parts - early morning waffle while I neck lots of coffee followed by the picture a bit later! Only someone who really enjoys baking or cooking will understand forgoing sleep to cook. The husband just didn't get it when I stumbled into the bedroom bleary-eyed a little while ago to retrieve some clothes for the day. I guess I should've figured that out last night when watching Celebrity Masterchef, he was astounded that to temper chocolate correctly, you have to be really precise with the temperatures - up to 45C then down to 28C to get the perfect gloss and crack. "But it's just food on a plate. It tastes the same whoever cooks it and however it's cooked" he said. I just sighed inwardly at those meals we had at Claridges and the Ritz when we lived in London being quite patently wasted on him. No chance of him ever stumping up to take me to Giddleigh Park. And on the subject of chocolate - I'll stop waffling very soon, I promise - if you're into that kind of intricate work, you should get a copy of the Squires Kitchen Guide to Working with Chocolate, written by the amazing Mark Tilling. Although I have yet to have a go at the intricate chocolate work (still waiting for Santa to buy me a chocolate thermometer! ), this book shows some beautifully simple techniques for decorating cakes. Okay so I'm a little biased as Mark is a very old friend of mine - playing Donkey to my Mary when we were in Infant school. But it's another much-thumbed (and personally signed!) book on my cookbook shelf that needs to be shown a little more love this year. Okay, the brioche starter is calling me - back later! The cut loaf - severely lacking in chocolate! So how was it. Well the jury is still out as to whether or not the labour of love that went into this was actually worth it. The first two slices showed a disappointing amount of chocolate. This may well be because I didn't want it to leak out of the ends and so tried to keep the chocolate about an inch from all the edges when I got to the rolling part. The brioche itself is lovely, light, buttery and rich - despite looking from the outside just like my usual plain white loaf that takes about five minutes to throw together and an hour to prove and bake. It would definitely make a good base for something else such as a bread and butter pudding or French toast - but as a standalone bread? I would probably double the amount of chocolate next time - hard to figure out how much 8tbsp of chocolate is when it comes in chunks so I used a tub of Waitrose chocolate chunks which looked enough pre-rolling but maybe not in practice. 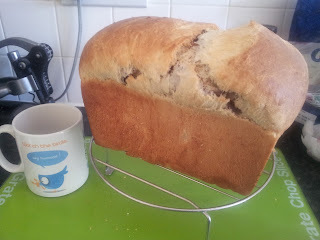 The other difference was that I didn't make two 1lb loaves as I only have one 1lb loaf tin and so made it in my 2lb tin. Anyhoo, one worth some experimentation with. 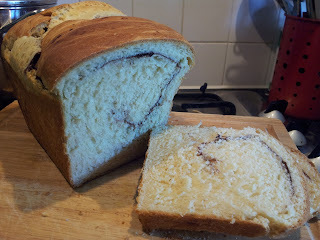 The recipe is from fabfoodblog but I've copied it over here with the UK weight conversions. More on my irritation with American measurements another day. Make the sponge. In a large mixing bowl, Stir together the flour and yeast, add the milk and stir until the flour is well hydrated. Cover with plastic wrap and ferment for about 45 minutes. Make the dough. Add the eggs to the sponge and whisk until smooth. In a separate bowl, mix together the flour, sugar and salt, then add this to the sponge mixture and stir until well hydrated. Leave to rest for 5 minutes. Gradually work in the butter in the dough, about one quarter at a time, until well assimilated. Then, knead the dough for about 10 minutes, adding flour if necessary. Transfer the dough to a large, lightly oiled container, cover with plastic wrap or a wet towel and leave to ferment for 90 minutes or until the dough doubles in size. Punch the dough then flatten it into a rectangle, whose short side is of the length of the baking tin you'll be using. Place this rectangle in front of you, short side up. Sprinkle the dough with the chocolate, cocoa and pistachio nuts, then fold over the top 3cm of the dough. Press the crease, then continue folding until you reach the bottom. Pinch the final crease well, roll the dough gently to make it even, then place it in the baking tin, seam side down. Make sure the ends of the dough touch the sides of the tin to help the bread rise. Cover and leave to proof for 60 minutes. Pre-heat the over to 180°C. Bake for about 35 minutes. Immediately remove the loaves from the pan and leave to cool for 1 hour or longer before serving.